Royalty collectors can indulge in an auction on the auction platform Catawiki this week. 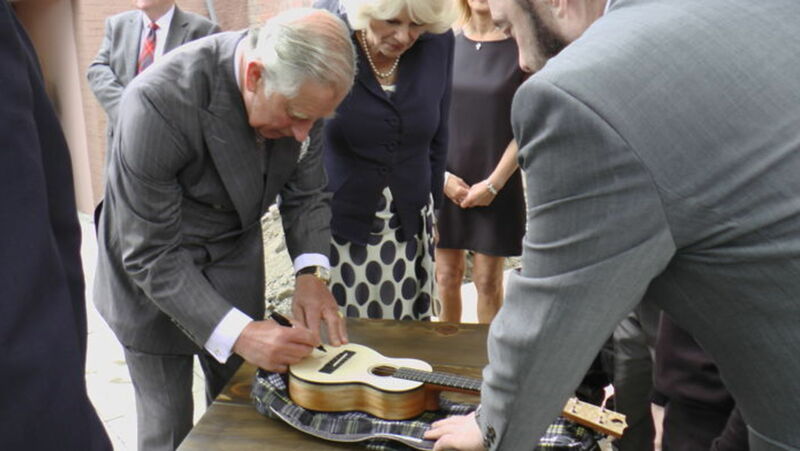 Catawiki is auctioning a ukulele (small guitar), signed by none other than Prince Charles and Camilla Parker Bowles. They signed the ukulele in 2015 during the reopening of the legendary pub Clutha in Glasgow, which was destroyed 2 years before when a police helicopter crashed into it. The 3 helicopter passengers and 7 visitors to the bar did not survive this crash. The full proceeds from the ukulele will go to Clutha Trust, the charity created by the owner of the Clutha bar after the crash, which supports underprivileged children through music and art. Catawiki expects a lot of interest in the ukulele. ‘’Items that have been signed or owned by a member of the Royal Family are currently very popular. For example, this month we auctioned the old Mercedes of the former Spanish King Juan Carlos for over €40,000 and an aquarelle by Princess Beatrix of the Netherlands (which she made at the age of 14) for almost €5,000’’.